It’s been one of those years of projects, the entire Kihei Surfside building being shut down for 6 months for a big exterior renovation, both the Palms at Wailea and Maui Kamaole pool decks being refinished with beautiful quartzite-look tile. Our last Palms at Wailea guest has checked out for the summer. Now we are actually doing some INTERIOR remodeling! Sig and I spent the morning at our condo, emptying bathroom cabinets, pulling out all the bedding, towels, beach gear, removing art from the walls. It will help make things less complicated for the contractor and protect our things from inevitable construction dust. This is the first of two loads we fit in our pickup truck. Now for finding a temporary home for it at our house! We bought this condo 4 1/2 years ago. Just prior to purchasing the condo, the previous owner had installed a beautiful white carpet to help the condo sell. Argh. White carpet in a vacation rental??? To be fair, most our guests have loved the soft, cushy (and very clean) carpet – it just makes the whole condo feel so homey. However, I’ve worked hard to keep it clean and stain-free, shampooing it at least four times a year, either with my own carpet cleaner or by calling in ‘the big guns’, my friend Dave from Jordans Services. But enough is enough, I’m done with the carpet! So tomorrow is its last day! We are replacing it and all floor tile with a beautiful new 20 inch porcelain tile. I am so excited! Of course, where do you draw the line? The bathrooms are still okay though a bit dated, so the bathrooms are being overhauled also. I am excited about the new oversized walk-in shower in the ensuite, replacing an awkward bathtub. I’ve also ordered new window coverings and we’ll be getting new bedroom furniture. Oh yeah, and the large wrap-around lanai is also getting a face-lift with new tile and new lanai furniture. We are scheduled to complete end of October in time for our repeat guests M & D to arrive. Yes, chi-ching, this is going to be one of the more expensive remodels we’re undertaking. But I can’t wait to see the new look! I will be sure to post pictures and get new professional shots taken once it’s complete! In the mean time, this condo is pretty booked up this winter. We do still have an opening Dec 9-19, 2015 and March 2-15, 2016 if you are looking for a winter get-away! Reminder, this is a two bedroom two bathroom condo which sleeps up to four guests. The stainless GE fridge we bought last year. Knock on wood, this one has been great! The other day we were enjoying the pool at our Palms at Wailea condo (the condo was between guests). 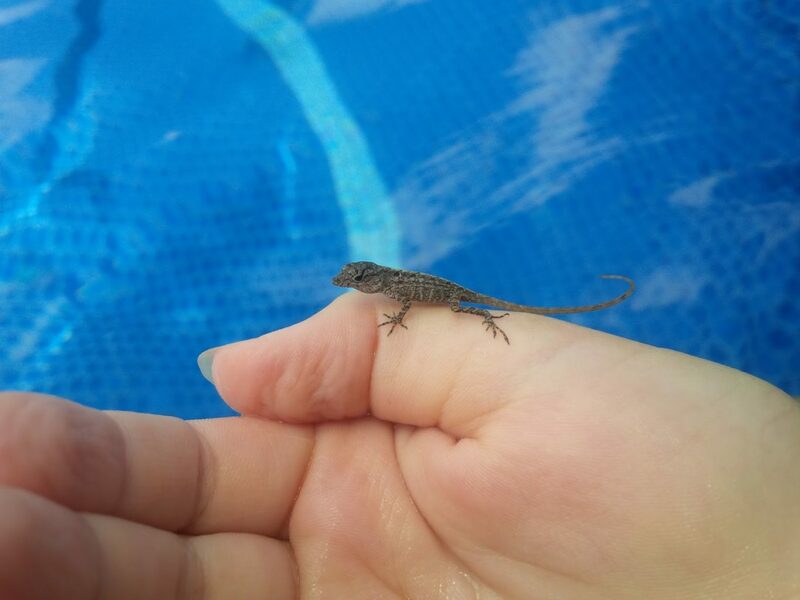 As we were cooling off in the pool, I saw a little gecko swimming next to me. I’m pretty sure geckos don’t belong in pools, in fact, I didn’t know they could swim. I scooped him up and the kids were pretty excited to hold him. In fact, he didn’t seem to mind, until one of the kids pretended to kiss him. He jumped to safety in one of the bushes closeby. Ha! I still vividly remember my first experience with geckos. Our eldest child was just a baby, sleeping in a playpen at the rental condo, when I saw a gecko in the room. I tried to shoo it out of the room, having visions of the gecko walking on our baby. Sig just laughed at me. He also laughed at me when I screamed because a cockroach has surprised me (I really dislike them). But seriously, you do not need to be afraid of geckos. Geckos are one of nature’s methods of pest control. They do not hurt humans, but like to eat all those insects and bugs we don’t like. In fact, in Hawai’i they are considered to bring good luck. So if you see a gecko, relax. He’s eating those annoying bugs. When he doesn’t find any, he will move on to ‘greener pastures’. We have some availability at three of our condos. Check it out! Our 1 bedroom 1 bathroom ground floor Sugar Beach condo is on sale at $139/night plus cleaning and tax for new bookings for all remaining dates from July 6-Sept 30, 2015. 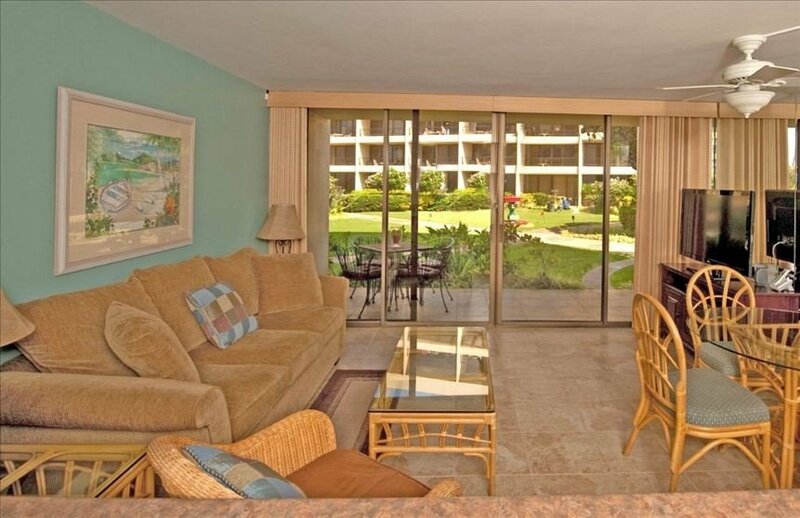 Our 2 bedroom 2 bathroom ground floor Palms at Wailea condo has some availability August 19-31. Ideally I am looking for a 10 night stay, or a one week stay starting August 20th or ending August 30th (so that we can maybe fit two bookings). Discounts will vary depending on how well your booking fits this opening. 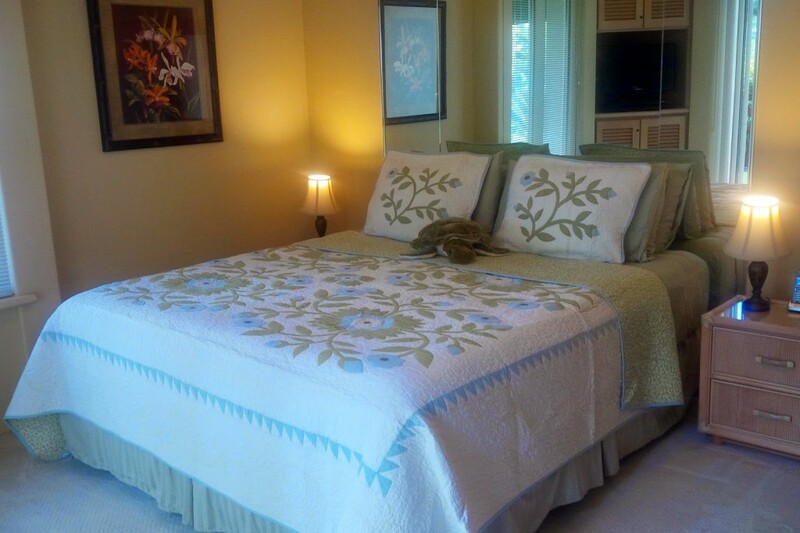 Our hugely popular 1 bedroom 2 bathroom ground floor Maui Kamaole condo has a fair bit of availability this summer and we are renting it out for a record low $145/night plus cleaning and tax for all remaining dates before September 18, 2015. Why so much availability you ask? I purposefully didn’t take any bookings for this month as the lower pool which is nearby is getting a new pool deck and I wasn’t sure just how loud it would be. The loudest part (blasting) has been completed, now they are cutting and laying quartzite tile. After spending some time in the condo, I am happy to report you can’t hear the construction noise as long as windows and doors are closed (we have a/c). Construction is taking place 7 days a week 8am-5pm, after which you can open the windows and doors and enjoy the oceanview lanai. And yes – there is a second pool a short 2 minute walk away, so you can still enjoy a pool and hot-tub. So what do you think? Is a Maui trip in order? Check the availability calendars and give me a call at 808-281-7934. You may have heard, the Palms at Wailea pool deck is being overhauled. The painted concrete is being replaced by a beautiful quartzite tile. I stopped by this afternoon to check on the progress. The colors look a little washed out, largely due to the construction dust. I can’t wait to see this in all its glory, the tile sealed, the pool filled. The project is estimated to re-open on schedule June 9th, 2015. The view from the look-out tower over the pool. The pool looks a little different with the water drained. Palms at Wailea in May!! Are you looking for a spring getaway? 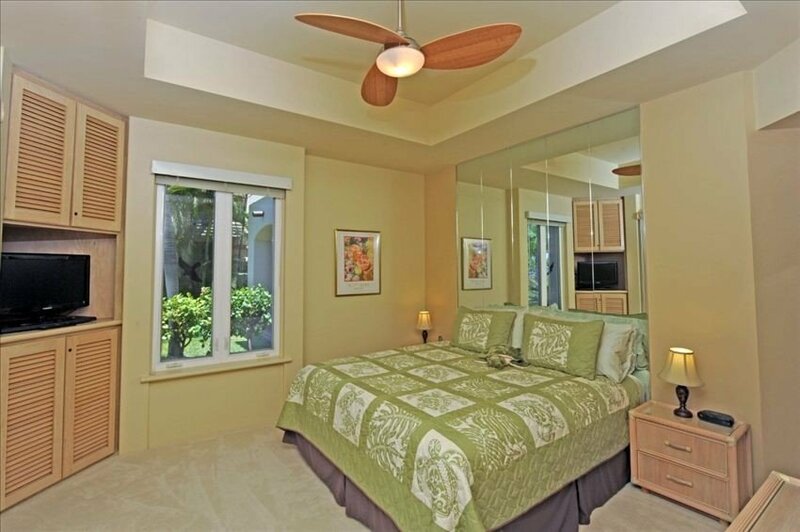 Our popular two bedroom Palms at Wailea condo is available for all of May. You have your pick of dates! The minimum stay requirement is four nights, the rate $199/night plus cleaning and tax. Two bedrooms, two full bathrooms, full kitchen, washer/dryer (with laundry detergent), cable TV, internet, private lanai with private BBQ. Walk or drive to the beach. Your closest beach is Keawakapu beach, but there are many options within a short drive with free parking at all beaches. The catch? The pool is being redone, so you won’t be able to use it. However, we have beach chairs, boogie boards, a cooler, beach towels etc. so hit the beach! First come first serve! Mother’s Day is in May…. hint hint. Check our VRBO listing for more information and give me a call! 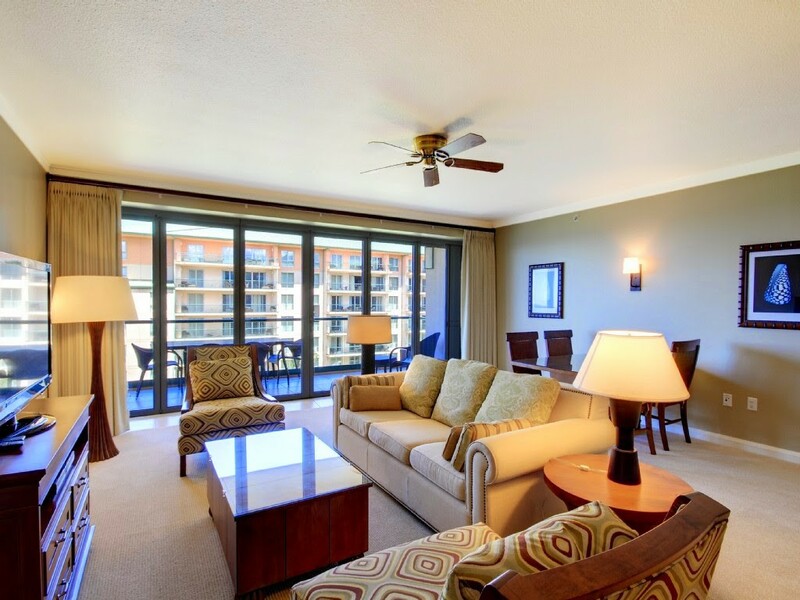 Spring Special at our Palms at Wailea Condo!! 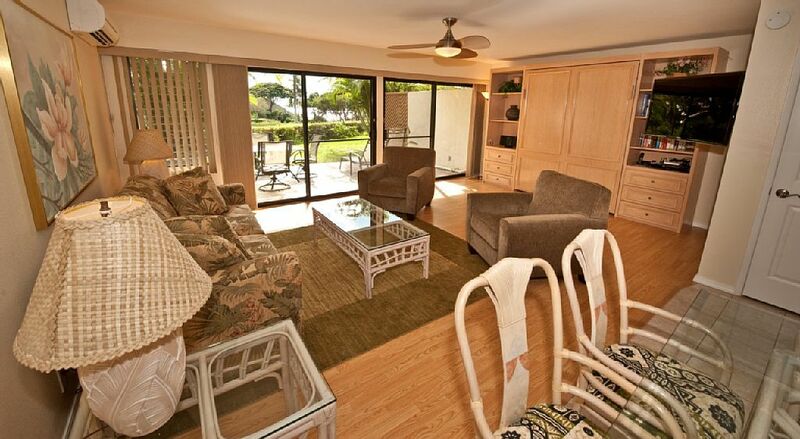 Our lovely 2 bedroom 2 bathroom Palms at Wailea condo has a spring special! 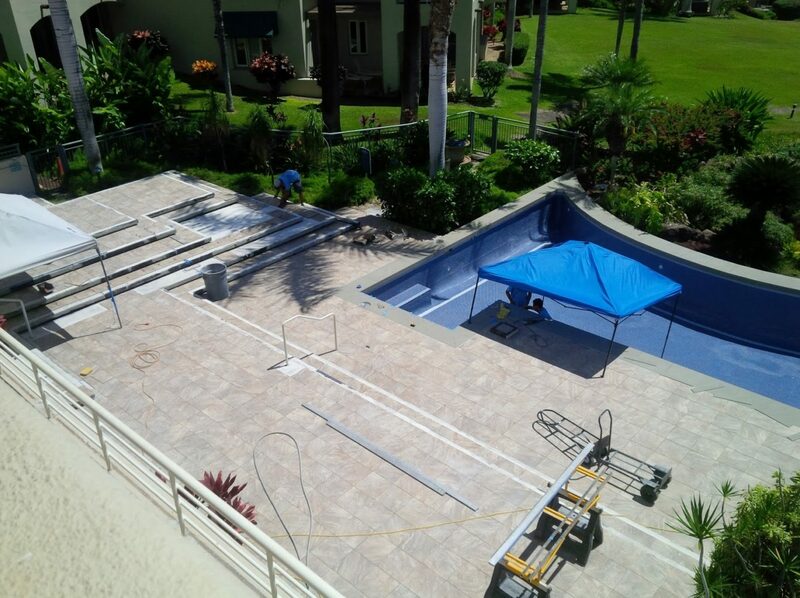 May 4-June 8, 2015: the Palms at Wailea pool and hottub will be undergoing renovations during this time. Our condo is a distance away from the pool, and as such we don’t anticipate hearing much (if any) construction noise. However, the pool will not be available for use – enjoy the beach instead!! We are offering a $20/night discount on new bookings during this time. Check out our VRBO listing for details, rates and reviews! Today only – 20% off Westjet Flights! Are you a Westjet member? Planning any trips this spring? By the way, looking for a place to stay? 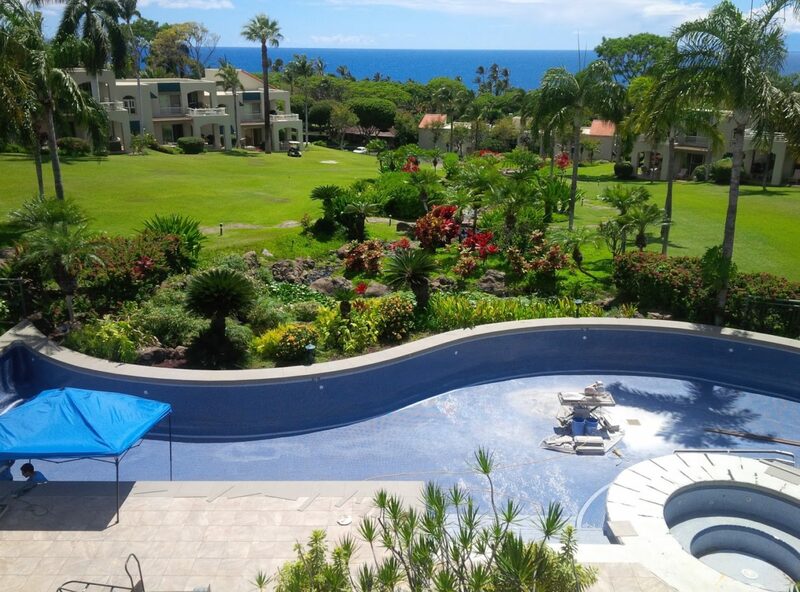 I still have availability for May and June at our Maui Kamaole, Palms at Wailea and Sugar Beach condos. Our family went on a little stay-cation this past summer. 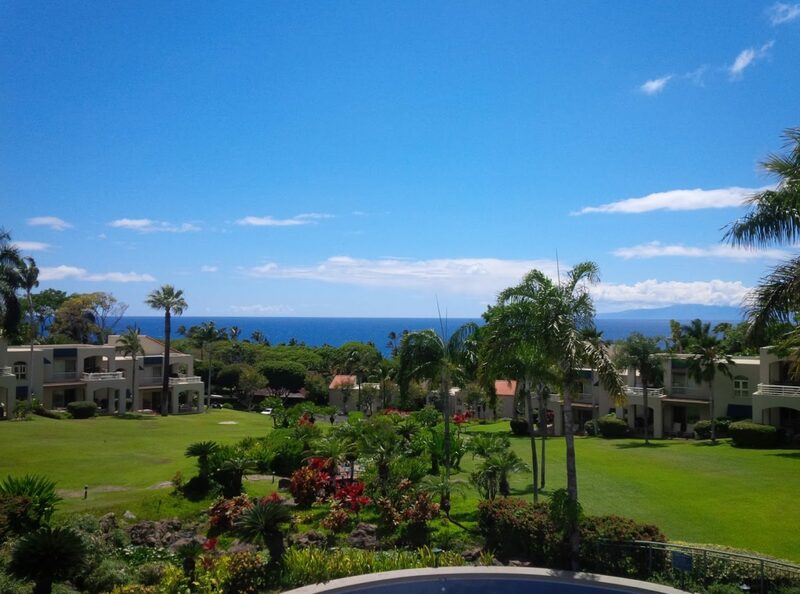 We drove an hour to west Maui where we had rented a beautiful 2 bedroom condo at the Honua Kai at the end of Ka’anapali. Call it a research trip. This is a five year old building, condos renting at double what our nicest condo at Palms at Wailea rents for (and that in off-season). Sig has drooled over this building for the past year, and I finally insisted we needed to stay there before we got too serious. From the moment we walked in the door, Sig was walking around, looking at finishings, details, appliances, ‘what do they have that we are missing?’ etc. I was trying to get all the frozen items from our cooler into the freezer, as he was pulling me away to read a label (the type was too small), or ‘check this out!’ Within the first minute upon arrival I realized this trip was going to be a write-off. Condo research supreme. And you know what, that’s fine. They had nice pools for the kids, our condo had a stellar view, and since Sig can’t relax or just sit, he might as well do something for the condos. 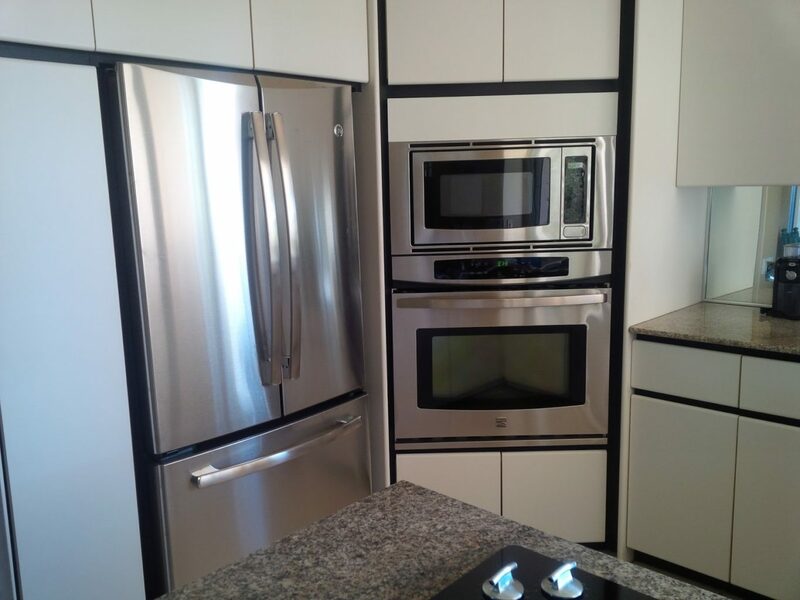 So yes, this condo has some beautiful features. And we’ve taken pictures, made notes and will consider if and how we can incorporate some of them in our properties. It also is missing some key things. Like hooks or a drying rack. As a family of five, we came back from the pools/beach and had no place to hang our wet swim suits and beach towels. You are not allowed to hang them on the lanai (thankfully, it would look incredibly tacky to see everyone else’s beach gear on the lanais), but there are no hooks and too few towel rods in the bathrooms. So we put them in the dryer, which took 2 1/2 hours to dry four towels – it was a fancy condensation dryer since the building does not have proper dryer ventilation. Wow – I groaned inwardly at the thought of the owner’s power bill. But Cara, what about at your condos, you ask? Our condos have either retractable hotel-style laundry lines in the bathtubs (perfect for hanging dripping swim wear) or collapsible clothes racks (or both). Please be considerate when using them indoors and set them up on tiled areas only (not carpets or laminate flooring). Looking back from our condo into the courtyard. 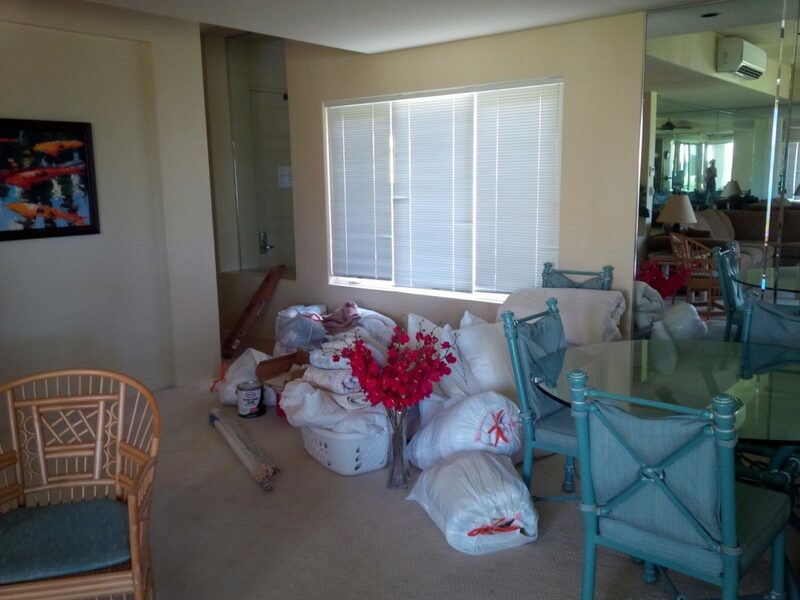 We loved the condo, but what would have made it perfect? Something to do in down-time, when you’re taking a break from the beach/pool. Like DVDs, or books, a stereo or some games. We loved having a restaurant (Duke’s) on site, and having a convenience store and gym in the building were definite perks. Parking was complicated (in the basement parkade of the other tower) and there was a daily charge for parking (our condos have parking closeby and it’s free). And instead of keyless entry (which our condos have), we had hotel-style cards to enter the building and our condo. A bit of a nuisance and an extra thing to forget. All in all, it was fun to get away and be a tourist, even if it’s just an hour’s drive away. But, it is an hour’s drive away from South Maui. And while we loved the complex, we have after much consideration decided not to purchase at this property. Many of our guests appreciate our being hands-on owners, just a short drive away from our properties, able to help when needed. A one hour drive (and that’s without traffic delays) is a little far away to be hands-on. Ah well. If you are looking for a place on the west-side and have money to spend, do check it out. It was wonderful. If you like a little more privacy, less busy-ness at more reasonable rates, do check out our condos. 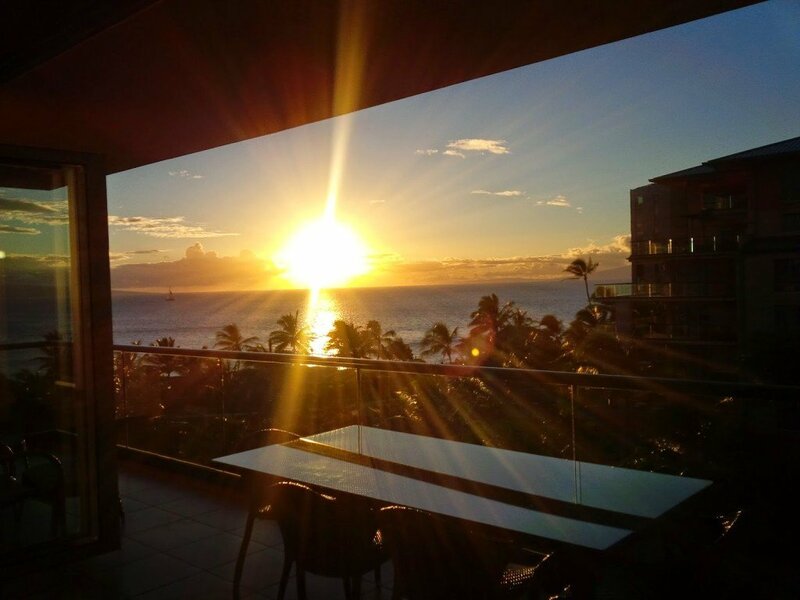 Is your Maui vacation rental legal? The front page article in this Sunday’s Maui News is about Maui County’s crackdown on illegal vacation rentals and bed and breakfasts. Are you feeling panicked yet? Chances are, your vacation rental is legal, especially if you are staying at one of the vacation rental resorts in Kihei, Wailea, Maalaea, Lahaina or Kaanapali. Many of those condo complexes are already zoned hotel/resort and are grandfathered in for vacation rental purposes (as long as the owners declare it as a vacation rental to the County for tax purposes – this would roughly quadruple the property taxes compared to if it is owner occupied). The illegal ones may be in condo complexes that have long-term (longer than 6 months) rental restrictions, or in residential neighborhoods (though there are some that are permitted in residential neighborhoods). 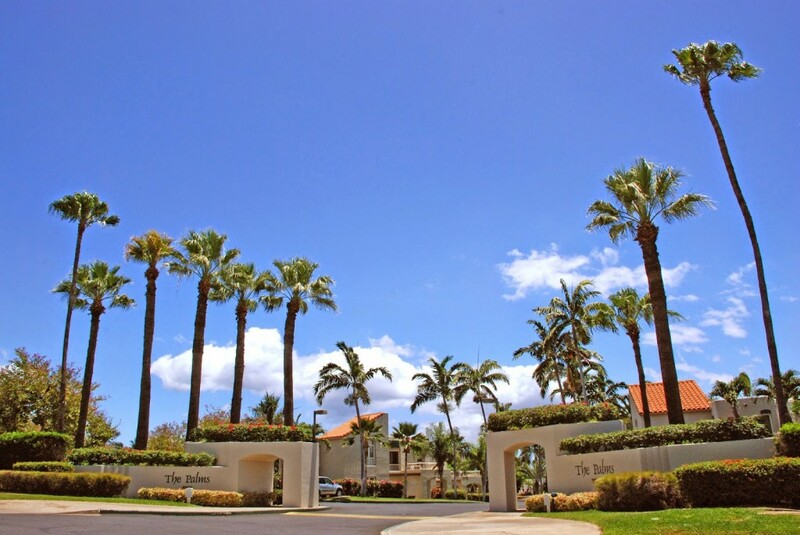 The entrance to popular vacation rental property ‘The Palms at Wailea‘. and the County of Maui’s property tax rates are adjusted accordingly). Why does the County care if a property is zoned for vacation rentals or not? The property tax rate is much higher than if the property is owner-occupied or even a long-term rental. Also, the County limits the number of vacation rentals and bed and breakfasts in residential neighborhoods to keep pacify the neighbors (when someone applies for a vacation rental or b&b permit, the neighbors have a say in it). The danger of renting an illegal or should we say un-permitted vacation rental or bed and breakfast is that if they are found out by the County, they have five days from receiving their notice to shut down operations, or will be fined $1000/day they continue operating. This means that your booking would be cancelled. In high season, this would be disastrous as everything is booked up well in advance. You may end up pitching a tent on the beach (oh right, on many beaches that’s also illegal). In the past the County has relied on disgruntled neighbors reporting these rentals, but now they are stepping up the ante, finding them on vacation rental sites, such as VRBO, Homeaway, Flipkey, Airbnb etc. How do you as the renter ensure your vacation rental is legal? – Are you paying taxes on your rental? Are you paying the correct taxes? There should be 9.25% TAT (transient accommodations tax) and 4.167% GET (general excise tax) for a total of 13.417% – these numbers are slightly different if it’s a timeshare property). – Does the rental listing and your rental agreement have a tax ID listed? Is it valid (check on this website, does the company/owner name correspond with the name on your rental agreement)? – What are the County’s property records showing for your rental’s address (sometimes this can be tricky to look up)? Look up the address on Google maps, does it look like a residential neighborhood? Again, there ARE some permitted vacation rentals/b&bs in residential neighborhoods, but they should have a permit they can show you. – Can I see a copy of your permit? If this is a rental in a residential neighborhood, they will need to have one. For the record, all four of our vacation rental condos are legal. We also collect and submit all taxes to the government. Book by December 29th and get 15% off bookings on flights to and from the US with Air Canada. Use promotion code GIFT2014. I just looked up some spring break flights – $506 Canadian return, all in, from Vancouver to Maui in March. That is a crazy good deal! Incidentally I have a few March dates available at our condos.